Meet our March Volunteer of the Month, Jerrie Eastman! Jerrie has been volunteering with us for the last six years. 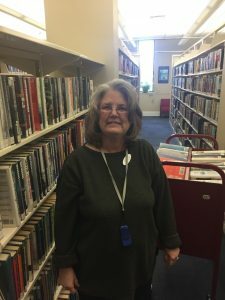 Jerrie loves to shelve DVDs and adult fiction. She always has a smile on her face and is welcoming to everyone she meets. She is a hard worker and enjoys reading when she isn’t volunteering at the library or elsewhere. When you see her, tell Jerrie congratulations on being our March 2019 Volunteer of the Month! “enjoys to read”??? how about “enjoys reading”??? library websites should try to use use good grammar! but I love the website.